This beautifully written memoir is the heart-breaking story of a young, privileged English girl's early childhood in Kenya in the 50s. At a time when the country is undergoing chaos and upheaval, Susie is neglected by her selfish parents and is forced to make a daunting life decision at age seven when they divorce. Confused by her parent's lack of communication with her and each other, she says she will stay in Kenya with her father.He later sends her away to a convent boarding school in England where her independent spirit often annoys the overbearing 'nasty' nuns. Her Nan is the only bright spot in her young life. Three cheers for Nan!When her father remarries he takes her back to Kenya to live with his new wife and child. Susie's stepmom is jealous and cruel which forces Susie to leave home at age 16.I understand why it took Susie Kelly years to open Pandora's box and sort through the painful times. I admire her determination to pick up the shattered pieces and learn how to choose a happy, healthy life. It's a page turner from beginning to end, and the title is a poignant reminder of the passing of time. Susie tells the story of her life with freshness and honesty, the hopefulness and humour of her young life is translated through the pages as if it had happened yesterday, and the unbearable sadnesses are enough to break our hearts and touch those lonely places in our own lives we had longed to forget. This isn't a story that wraps up neat and tidy, it's real life and that's never like the movies, kid, but I hope that for Susie and the rest of us there is some comfort yet to come. Thank you, Susie Kelly. Disappointment; thought book would be more about Africa and less about self. Something of a pity party. Couldn't put this one down, so finished it in two readings. Susie Kelly's tale so touched my heart. Her young life torn apart by parents' divorce, she struggles to find happiness in England and Kenya, but such moments are brief as a result of the lack of love and support she sees in those that should love her. Only her horse Cinderella brings her that joy, and she must part with that as she must every brief moment of happiness. It is a sad tale, but Susie Kelly tells it with such compassion and humor, you must pursue her next obstacle and hopefully a victory. If you were (or are) a child of divorce, beware, this will "hit you in the gut." Modestly described as ‘a memoir of life in post-war London, colonial and post-colonial Kenya, and a dysfunctional family’, I must admit I was interested because I was also living in Kenya at the same time as Susie, during the difficult and dangerous transition to independence.I was delighted with the evocative details on almost every page that took me right back to my childhood. What I didn’t expect was to be put through every emotion from laugh-out-loud humour to heart-wrenching sadness. This is a wonderful recollection of a fascinating life – yet also a story which Susie admits was very difficult for her to write.One of the unusual benefits of reading on a Kindle is the option to see what other readers have highlighted – and one of the most frequent was the poignant line ‘when people suffer terrible losses they need to have an opportunity to talk about them.’This book had me gripped from the first page and left me feeling quite emotional at the end. Susie wins my ‘best book of the year’ without hesitation for the quality of her writing and the honesty and truth which makes it such a great read. I highly recommend I Wish I Could Say I Was Sorry and happily award a rare five out of five stars. I don't cry. Toward the end of this one, I had tears in my eyes. It's poignant, fun, real, and historical. I don't know of a book I've read lately that has covered in depth a British family at the end of the British occupation of Kenya that really has touched on the heart and soul of that period of time. I highly recommend this book to just about everyone. Much respect for an amazing woman!Another great read from Susie Kelly! I have several of the authors books and have thoroughly enjoyed them. 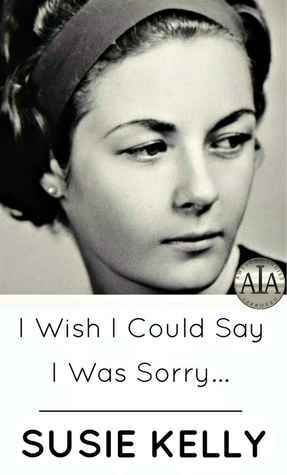 I Wish I Could Say I'm Sorry gives you a look into Susie's early life in the UK and Kenya. After being asked to make a life changing decision at the young age of 9, she is unwillingly sent back to the UK to live with her father's parents and then into a Catholic boarding school. The story takes you on into Susie's adult life as she enters into marriage. Not the best of circumstances to say the least. It seems that she can never catch a break. The author tells the story without needing sympathy for herself and her circumstances. It's a beautifully written memoir.I have gone right into reading the sequel- Safari Ants, Baggy Pants And Elephants: A Kenyan Odyssey. Amazing, poignant, funnyI read this not knowing what to expect. Wow. An interesting memoir is a vast understatement. Honest, heart-wrenching, sarcastic and funny many times, and well written. Very moving. I plan to read all her works. Life was tough, but she was tougher. And laughed in its face! Amazing storythis is such a beautiful story. I feel honored that the author shared such a personal history and photos.a must read. Susie Kelly has the gift of an extraordinary memory. We may, in theory, all have this gift. And we may, in theory, all remember — even if only in our dreams.But Susie Kelly has an additional gift. She has the ability not only to remember, but also to give verbal expression to those memories in extraordinary form.If you, as a potential reader — and I use that word “potential” advisedly — are not grabbed hook, line and sinker by the first few sentences, move on. Choose another book. This one is not for you.But if you are hooked, hold on — and ride this story for the life of it.I would be hard pressed to call Susie Kelly a ‘stylist’ — at least not in the traditional sense of the word (although what follows immediately might well prove the exception to my little rule). Nor would I call her a prominent punctuationalist. No, Susie’s style is in the choice of her details to remember and relate, and Susie’s punctuation is in the punctilio of those details.“I’ll never forget sailing through the Suez Canal. Silhouettes of camels, donkeys, men and children glided by on the palmy sandbanks as the sun folded itself from a brilliant red ball into a sliver that slid gracefully from sight into the blackness of the night.” (Chapter 2)Reading Chapter One, I’m transported to perhaps my favorite animated video of all time — also British — titled “The Snowman” (1982). If fellow Americans have never seen this video, I can’t stress enough how brilliant and memorable the execution of it is. Comparably brilliant and memorable is the prose of Susie Kelly’s first chapter. If you want to get an idea of what things were like for a young child in war-tinged Britain and on a continent torn and ravaged by the same WWII, this is as good as it gets. We in America who were not soldiers at the time know nothing of these conditions — except through film. We were too busy dancing — then making and exporting to Europe the things that would make us rich. It was a new kind of noblesse oblige — and the noblesse in this case was a burgeoning middle class.As Spartan as the conditions Susie Kelly describes in post-war Britain might’ve been, one can only venture a guess as to how sub-Spartan they must’ve been on the Continent — in any case, probably too subterranean-Spartan to even venture pen to paper (if either of these two was even available at the time).Quite apart from rendering these expert descriptions of post-war Britain in the first half of her novel, Ms. Kelly reminds us of how much goes through a child’s mind from first cognition through early adolescence. For those of us who are also parents, this can be a harrowing experience — suggesting, as it does, that the proverbial tabula rasa that is a child’s mind corrects the ‘rasa’ in short order by registering, recording, assimilating, decoding and eventually sitting in judgment long before our little darlings first appear to us to be thinking adults.We can only hope that those same little darlings don’t possess an ability to recall and report equal to that of Susie Kelly!I’ll be the first to admit that a lot of the vocabulary, setting and events Ms. Kelly describes during her “Kenya era” would’ve been unintelligible to me had I not first read — then seen the film version of — Isak Dinesen’s Out of Africa many years ago. Is (or was) Susie Kelly the new Baroness Karen von Blixen? No. Susie’s experience of Kenya was not that of a coffee plantation owner; nor was she born of the Danish nobility — and lucky for us, it and she were not! While we may — in fantasy — identify with Meryl Streep or Robert Redford, we can — in reality — identify more judiciously with Susie Kelly. And how refreshing it was to read that a pre-adolescent Susie Kelly herself could’ve fantasized about marrying the young tribesman, Arap Rono, out of sheer joy and appreciation of his own joie de vivre — even if already at that tender and innocent age, she recognized the social injunctions against marrying a black.Did I say earlier that Ms. Kelly isn’t a stylist? Maybe not. But the following paragraph from just past the midpoint of the novel would certainly suggest that she’s quite an adequate and sufficient sensualist!“I loved Cinderella. I loved the smell of her breath when she’d eaten hay, and the smell of her flesh when she sweated. I loved the smell of her droppings in the straw. I loved the gentle way she took a mint from between my lips and rummaged for more in my pockets with her soft nose. I loved the way her ears pricked as soon as she saw me cycle into the yard, and the soft whickering noise she made to greet me. I loved the way she galloped out into the field when I turned her loose, her head and tail high in the air, whinnying her pleasure. I loved the way she would see me from a distance and race across the paddock whinnying, jerking to a halt inches before the gate. I loved her spirit, her enthusiasm, her bravery, her willingness, and the wisdom in her dark eyes. I loved the way she stood quietly dozing in the warm afternoons, one hind leg bent, while I sat and read on the straw in her stable.” (Chapter 16)At about the same point in the book, however, we see how a pair of controlling parents can induce a child into submissiveness. I have to wonder whether this is a foreshadowing of things to come as Susie Kelly grows older…. All we can say at this point is “Thank God for the neighbors!”In Chapter 17, Susie enters true adolescence — and we shudder at what’s in store (for us as well as for her!). Nature has this funny way of exerting its gravitational pull, and we suspect it’s going to be straight down to the ground. But then, she did name her horse ‘Cinderella’….At the beginning of Chapter 25, an entirely new chapter in Susie’s life begins: a son is born. If this sounds a bit like that other famous proclamation in Händel’s Messiah, forgive me. But for Susie, we feel, it’s every bit as portentous as she silently invokes the wisdom of Solomon in her battle with an intrusive mother-in-law.In Formal Logic, you can’t derive a ‘universal’ from an ‘existential.’ In plain English, this means you can’t reach generalized conclusions on the basis of one instance. Good thing, too — because if you could, you might be tempted to conclude, based on Susie’s experience, that marrying into an Italian family would result in slow death by suffocation.A few chapters later, a second new chapter (in the form of a baby girl) makes its way into Susie’s life. But shortly thereafter, the culture shock of a move back to England — with all of its attendant rudeness of time-cards and work bells for a woman who’d grown used to a gentle, orderly and comforting Kenya — comes knocking at life’s door. As does a husband grown increasingly indifferent, alcohol-centric, and downright hostile.At this point, I’ll resist the temptation to let a teaser slip through my fingertips and out onto the keyboard and say simply BUY THIS BOOK: you won’t regret it! I Wish I Could Say I Was Sorry is the kind of autobiography we should all write — or at least read.RRB3/08/14Brooklyn, New York, U.S.A.
Easy read. A bit out of wheelhouse. Learned a bit about Africa, Kenya more specifically. This is another cracking Susie Kelly book.I feel I know Susie, although we have never met. We have much in common. We are roughly the same age, both war babies; we seem to have the same attitude to animals and to food; we both live in France; we have both undertaken epic walks and written books about that. We have corresponded and discovered many coincidences between our lives. We even seem to have both put our houses on the market at the same time.But many others who have read Susie's books will also feel they know her. This is the mark of an exceptional writer - Susie draws you into her world and you experience the adventure with her.In the case of "I Wish I Could Say I Was Sorry" this means that we suffer, as Susie clearly did so often during her early life and also while dredging up the painful memories to put them on paper. Susie's writing is so evocative that once again we are with her, having to decide between parents at the age of seven and at zero minutes notice; finding that the chosen parent sends her away from the chosen country to a dreadful school run by nasty nuns; being told that she will now be going back to Kenya and, oh, by the way, Daddy is now remarried and has even had another child; being plunged into a household run by a neurotic and volatile stepmother and a father who is distant because he presumably does not want to rock the boat. And don't mention the mother!As an adult, Susie plunges into another situation with which I am very familiar - she marries into an Italian family. I have not done that, but one of my daughters has, and Susie's experiences as a non-Italian daughter-in-law were very recognisable and not to be recommended.I could go on with more about Susie's relationships with her mother, her father and her stepmother, how all those ended and the traumas involved. But I have said enough and do not want to tell you the whole story before you read it. All I will say is Get This Book. There are not as many laughs in it as there are in other Susie Kelly books, but I guarantee it will make you cry. Whether or not you have experienced anything similar you will come out in sympathy. If you have not, you will thank your lucky stars that your childhood and early adult years were not like this. There are of course happy times but the miracle is that Susie has survived to become the person she is and to entertain and inform us in that wonderful way she has. I have read all Susie’s previous books but this is a whole different kettle of fish.This is not about the goods and bads of a life in France but the joys and despairs of Susie’s early life.I always learn things from her writings and this story is no exception. A lot of it is set in Kenya before and during the transition to independence. My knowledge of Kenya was sketchy to say the least. I now understand far more about those days of the fading British empire.Susie has a great knack of bringing characters to life in a way that you feel you are involved with them all. In one of her first books, I remember an overwhelming feeling of one person taking advantage of the writer’s good nature. It made me feel like telling that person to get lost and sort things out for themselves.In this book at one point I was almost ready to shout at the book: No, no don’t do it!The whole story is a great tug on the heart strings. For me there were memories of years ago, particularly old relatives, and a way of thinking and behaving so different to today.It is hard going. I hasten to say not heavy, but hard in the sense that you sometimes want to stop reading for fear of what is coming next but you simply can’t just stop.I’m not sure enjoyed is the word to use as it is difficult to take enjoyment from some of the events re-told but I couldn’t put the book down and have every intention of reading it again – after I’ve returned to one of Susie’s French pieces to remind me that she survived it all with her sense of humour intact.Thank you Susie for sharing it with me. A touchingly honest autobiography about growing up in a time when the world was in great transition. The clashing of cultures of countries, and families and eras, Beautifully written giving a view of post war England and late and post colonial Kenya. I felt that I was there with the author and daughter myself longing to visit, even though I know that the world has yet changed, several times over, since the time she lived in Kenya. My heart broke for this brave and optimistic little girl, who, in spite of all of the negativity and rejection in her life, found and cherished people and their acts of kindness and love that were equal parts of her life, rather than reject them as irrelevant compared to the pain. I salute the author and her courage to examine her heart rather than sit still with simplistic answers, to find her truth. Bravo for a story so well worth reading and savoring! Books are escapism, and Susie Kelly's books about her adventures and life in France have kept me entertained over the years.I knew this book was going to be different, but nothing prepared me for its content.When you see an author's picture, and have followed her escapades, somehow you feel in a way, you know her. This book dispels that illusion. The title is easily understandable, everyone regrets not having the chance to say things, or leaving it too late...What a story! Written in Susie's extremely honest way, but unlike her other books, in this one, we learn of her childhood in England and Kenya, her life choices and the decisions she has had to make.An open, heart-rending insight into her life, which I found a compelling read. This book was a beautifully written honest account of a childhood which was spent between Kenya and England. Everything fell apart for little Susie when her parents split up. I wish that Susie had opted to live with her mother, as the sheer coldness and lack of love from her father was really chilling. The author experienced tragedy and mental cruelty from family members, but fortunately was able to overcome all obstacles and negativity, showing great spirit and courage. I loved this very well written memoir of a life spent in Kenya and England. The author draws you into her world, and makes it almost impossible to put the book down. Ms. Kelly is a true survivor, very honest, and with no sniveling. Anyone who has lived through step-parents can relate to this memoir. I highly recommend. An interesting life!Well, Susan Kelly certainly didn't live a boring life. Not a particularly happy life but more the victim of bad luck and bad choices. I guess it all came good in the end! Good bookA wonderful read by a wonderful author. Deeply intense and thought provoking as we all struggle with life decisions and how it shapes us as we grow. Evocative, poignant, funny and brutal. A very bittersweet coming of age story. I wanted more about Africa but it was well written and touching. Interesting memoir of life in Kenya. Sad. I don't like books that make you feel low. I hope she eventually found stabilty & happiness. It was okI feel sorry for her that she had such a detached childhood and didn't know love and warmth after her parent divorce...that's hard for any child. her exploits didn't seem unusual or particularly alarming. I think based on the description I was expecting something very different, something more triumphant. a reviewer said "A Child Called It meets Out of Africa"...I have to disagree. A Child Called It was a horrific true story of child abuse and attempted child murder with none intervening because in those days what happened in the family stayed in the house. Ms. Kelly certainly had her share of emotional neglect and I'm not trying to minimize that, but I kept thinking what is the point of this story....to be honest I am not fine reading it...I am on chapter 17....so I will update my review once I finish. I was bothered by the typos, which there seemed to be more and more towards the end of the book. I also thought, though I liked the many details, sometimes there were so many I became confused. It took me a while to get into the book, and even set it aside for a time, but I'm glad I came back to it. After I picked it back up I finished it within a day!I really found this book interesting once I got into it, and though our experiences are very different I found it interesting that I have felt the exact way she described herself feeling about herself, the people around and close to her, and life in general. I hope she and her children are still happy!! Oh, and I loved to be able to see the pictures!! I wish there were more!! I really enjoyed reading this, but it is meandering and a little repetitive. The tales of childhood are so detailed and rich, but when she gets to her life as an adult, it's a different story. Perhaps the memories of this period of extreme loss are too painful for her to delve into in any detail. It would have been interesting to hear more about reintegration into England and the effect of the tension between her Italian in-laws, their Kenyan upbringing, and the dissolution of her marriage (and the subsequent custody issues and kidnapping) on her children. The gut punch of the epilogue put a whole new twist on the title for me, and cast a sadder pall over the book than the words of the stories alone could give.